Who do we sell to? Seems like a silly topic to me, but I have recently noticed some posts on Facebook in various forums, so perhaps this is a question you would like an answer to from us! I am happy to sell to any INDIVIDUAL living in FAMILY CIRCUMSTANCES who demonstrates a love and passion for the breed, and has NO intention of selling on or placing the dog in any home other than of this calibre … with the overriding proviso that if your dog shapes up to representing an individual as defined in the breed standard and true to the original breed, that has good health and robustness and longevity, and is of worthy genetic quality you undertake to CONSIDER to let those genes contribute to future generations ONLY by knowledge-based mating selection and if you have a substantial number of family homes ready for pups … commercial businesses and entities need not consider Clumbers nor our Clumbers..
We are NOT here to horde the genetics of this breed, we are here FOR the breed, we get to share in this breed’s fabulous history for a short segment of the breed’s life … it is our responsibility to improve structure, health, and fitness of the breed within the constraints of physical health and fitness, to adopt verified breeding recommendations, to screen for known, suspected, or likely health issues, to breed to ensure these are at least minimized in the population, and definitely not to increase such incidence, or produce dog’s that are affected to any degree that causes them pain or gross discomfort … and we have to do this with a small genepool and few breeders, but at least breeders from a diverse geographic background. BTW show wins are but ONE of MANY selection criteria, in fact show wins aren’t high on our selection criteria! 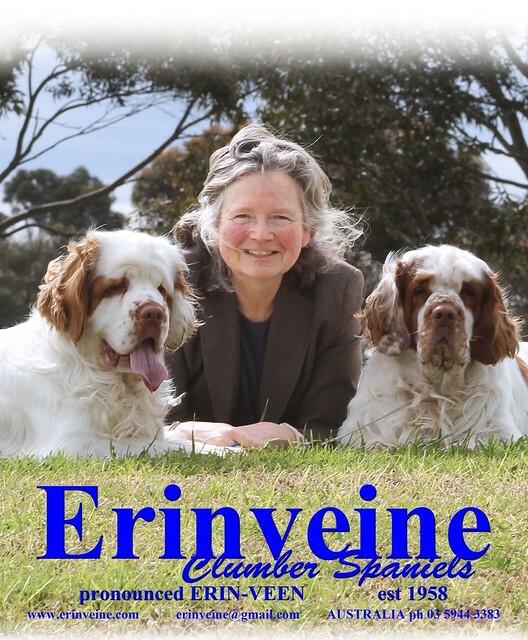 Shows are valuable in that they give the breeder and owner a chance to see what an ‘outsider’ thinks of the dog and generally what they think of that dog with regard to general fitness and the breed standard. There is only one winner on the day, it does not mean there are not actually more than one exhibit worthy and justifiable of being the winner on that day. you continue to respect the dog for his soul even if he doesn’t live up to your demands or expectations, or the judges fail you! you can find time after competing, or whenever, to answer questions, from whom ever!